This article appeared in the thirtieth anniversary handbook of TA. It is a chronological history of TA from May 1964 to May 1994. The first issue of The Astronomer magazine appeared under the title of The Casual Astronomer in May 1964. "... Owning a telescope, by itself, makes no one an astronomer. Enthusiasm is the vital requisite; and enthusiasm is born, not made. Every month a hundred newcomers buy a telescope and equip themselves. Every month a hundred disillusioned amateurs gradually bring out their instruments less and less often as the first keenness dies down and they seek something else to occupy their leisure hours." Perhaps we can be accused of varying the objectives a little, by holding yearly meetings to bring together the active observers amongst us, but we still hold fast to our aim of rapid publication of results which is unrivalled in this country and still does not, we believe, compete with the other major organisations, rather it complements their work. In the second issue a note appeared by G.E.D. Alcock, already known at that time for his comet discoveries of 1959IV, 1959VI and 1963III, regarding five stars omitted from Atlas Coeli. Little did we know then that this would lead to a massive compilation of such entries appearing in many issues of TA and in the Binocular Sky Society reports. A year later (vol. 2, No. 14) found the magazine still going strong and the beginning of probably the most famous series of articles published, From the Night Sky, by John Larard, the then secretary of the magazine. "During the night of June 19-20 (1965) I spent a hard working observing session at the University of London Observatory at Mill Hill... It is always interesting to find out the penetrating power of the telescope and the Fry telescope proved most interesting in this respect. A view of the star alpha Del revealed no less than 5 comites". In the same issue Larard listed the five comites and mentioned that only B at mag 13.5, 28".9 from the primary, was not seen. In the Nebulae and Clusters department he mentions seeing M12. His delightful descriptions fired enthusiasm from many of our readers over the years to try for themselves to see the great deep sky objects and double stars awaiting our searches. It was perhaps inevitable that a magazine catering for the pure observers would, over the years, produce a large amount of major discoveries. This was started, also inevitably, by George Alcock finding comet 1965h. "The new comet was first detected at 2115 UT on 1965 September 26 on the first really clear night for several weeks. The object was very faint and because of the artificial lights glowing upwards from the many local brick kilns it was not possible to be certain that the suspect patch was moving. By 2100 I felt that this was indeed so but decided to ring M.P. Candy to verify the matter. Owing to shower cloud at Hailsham this took a considerable time, and the telephone call confirming that it was a new comet could not be made until 0035 [the next day]. To Candy, with his 5" comet sweeper, the new comet was easy and large against a dark sky. The new comet appeared to be less than 10th magnitude, and so was the faintest one of the four discoveries" (Vol. 2, No. 18). In the 1965 November issue, John Larard was writing the Editorial in the absence of Muirden who was then in Crete. That issue carried news of Comet Ikeya-Seki, 1965f, discovered on September 18 by two Japanese observers. This comet received incredible publicity from the media and the comet turned out to be a Sun-grazer. In 1966 June, the first of a series of Total Eclipse articles appeared in the magazine which still appear now, mainly under the hand of Eric Strach. At that time, however, the magazine launched its own expedition to Lesvos to observed the solar eclipse of 1966 May 20 and a vivid and exciting account appeared in that issue (vol. 3, No. 26). Over the years the magazine has taken a lead in recognising and attempting to fill "gaps" in the amateur observing programme. In the 1967 February issue, a case for a Double Star Section was made by R.W. Payne. It is interesting that the BAA have now adopted this idea within their Deep Sky Section but the gap was not filled then and in the 1967 June issue the announcement regarding the formation of The Webb Society followed by John Larard. Whilst some people were organising projects and sections, George Alcock continued countless hours of sweeping for comets and novae. By the 1967 August issue he had again been successful with the discovery of a nova in Delphinus. "... Nova Delphini was discovered with a pair of 11x80 Beck hand binoculars, which had been used for this work since 1964 April. These have a field of five degrees and excellent definition almost to the limiting edge of the field, which helps in the rapid identification of moderate-sized patterns and is easy for the eye... The nova was found on July 8 (1967) and 2235UT after only twenty minutes of searching, and it appeared as a normal sixth magnitude white star, in a position where, I was sure, no star had been seen before. It was recognised immediately, at first sight. So large is the task of covering the galactic fields that I am sure I must have by-passed this region on several previous nights, for the nova seems to have first brightened on about June 30... The welcome sound of the ringing telephone came at 2315UT. It was M.P. Candy, speaking from the dome of the 36" Yapp reflector. A spectrogram, the first one of the star, had been developed. It was still wet, and as they held it up to the light they could see the tell-tale Hydrogen emission lines of a true Nova" (Vol. 4, No. 40). In the 1967 November issue, Doug Saw, then an observer of eighteen months experience, found RS Oph, the recurrent nova, bright and reported in the magazine that it was of magnitude 5.4 on 1967 October 26. He highlighted a most important point which is still relevant today. He was unsure of the procedure for reporting discoveries or to whom he should direct the news. He called for publication of this information. TA, today, largely fulfils this role, for UK observers, and indeed for many living in European countries and beyond. "... So far as TLPs are concerned, I think that it is now recognised by all competent authorities that occasional red glows are seen. The trouble is that the observing of these is very difficult, and it is only too easy to be mislead... Anyone anxious to contribute to TLP studies must learn their way very thoroughly about the Moon, and he must realise that he will have to undertake many hours of fruitless searching before he has any hope of seeing anything unusual. Indeed, he may never do so...". (Vol. 4, No. 45). By 1968 March, The Webb Society, had published its seventh bulletin which included details of a supernova watch on nearby galaxies. In the editorial of TA 47, Muirden mentioned that since S And of 1885, 200 extragalactic SNe had been photographed up to 1968. The average periodicity for any single galaxy is one SN every 350 years. We now fully appreciate that this varies dramatically from one type of galaxy to the next. The combined TA/BAA supernova search programme is actively seeking out these important celestial events. George Alcock was back yet again in the 1968 April issue reporting his second nova, this time in Vulpecula. "On the morning of 1968 April 15, G. Alcock found a possible nova in Vulpecula at 19h 45m.9 +27 02'. The star was creamy white, its magnitude about 5.6... The star was first noticed at 0215 using 11x80 binoculars." There was some speculation at the time as to whether this might have been a new flare up of the 3rd magnitude object of 1670 which remained a naked eye object for several years. This was later discounted. A supernova in M83 introduced the now famous name of Jack Bennett, of South Africa to the pages of TA. In the 1968 September issue, a report by T. Lloyd Evans indicated that Jack Bennett had discovered the SN visually in the evening sky of July 16 (1968).whilst searching for comets with his 5" refractor. "He has familiarised himself with all those nebulae which might look like comets. He saw an object which he did not recognise, but found that its position was that of the galaxy M83. It appeared to have a very bright nucleus of which he had no record from his previous observations. He immediately telephoned the Radcliffe Observatory. Two spectra taken that night showed the rather featureless spectrum, with very broad emission superimposed on a smooth continuum giving a wavy appearance. This sufficed to identify it as a supernova." (Vol. 5, No. 52/3). Throughout its history TA has involved many observers who find binoculars are sufficient to conduct a useful programme, not least in the field of variable stars. In the 1968 December issue, this was discussed. With then 20,000 known variables, and a good proportion visible in binoculars, there seemed to be a case for observing the Northern Hemisphere objects on a systematic basis and reporting them in TA. The magazine still does so and first the Binocular Sky Society and then the BAA/VSS Binocular Group have been responsible for the analysis of such results. Many important facts have come to light from these objects which, at one time, were almost totally neglected. During 1969 some magnificent planetary drawings graced the covers of the magazine and were supported with extensive planetary notes within each issue. In 1969 June Keith Hindley reported a new meteor shower emanating from the constellation of Lyra on 1969 June 13-15. Meteors and fireballs continue to be included in TA reports to this day. The note which had appeared in the second issue by George Alcock regarding Atlas Coeli omissions had lead to a massive collection of items by this time and John Isles in the 1969 July issue summarised the position to date. At that stage some 500 errors had been noted and the first Binocular Sky Society report had given details of most of these. John urged the work to continue with the task of producing a complete visual atlas of the sky which would mean that observers finding something unusual would know whether it might be a new variable or a nova rather than just another atlas error. The editorial of 1970 January contained news of the discovery of Comet Bennett 1969i by J.C. Bennett. Many believe that this was one of the finest comets to be seen during the entire history of The Astronomer. In 1970 George Alcock discovered his third nova. The 1970 August issue had the now regular account of how he found the nova in Scutum. "On the evening of 1970 July 31, routine nova sweeping with 11x80 binoculars began at 2110 in the neighbourhood of Cygni. I looked at most of Cygnus, the head of Draco, much of Hercules, Ophiuchus down to the line to . About 40 minutes later I was moving up from Sagittarii to Aquilae. Reaching the area of the variable star S Scuti, I was immediately worried about a 7th magnitude star about 1 following Scuti. Checking it with the 25x105 binocular telescope I estimated the star to be of 6.9 magnitude, and it had a rich golden colour. The star had a much fainter companion about 1 minute of arc in a north preceding direction." "... On the following evening, August 1, cloud cleared but a thick haze remained. In the twilight I made a hurried check of the area with 11x80 binoculars at 2125. At once I could see no star where the 6.9 mag star had been the previous night! Using the binocular telescope the "double star" was found in a few seconds, but the bright component had faded to 7.8 magnitude." "... At the moment I feel that the visual routine discovery of a 7th magnitude nova is quite a breakthrough in this type of work, and not merely a question of luck." (Vol. 7, No. 76). TA is always coming up with something different in the observational aspects of astronomy. In the 1971 December issue the cover contained Naked-eye visibility tests by G.E.D. Alcock. An area of Cepheus had been drawn recording stars down to mag 7.0 with the naked eye! I wonder if such feats are still possible in today's skies? "... On January 17 (1972) I was searching, unsuccessfully, for R Leporis and decided to find out how far south I could see. By balancing precariously on a low table next to an upper floor window, I was able to see over the roofs of nearby houses. A bright star was immediately seen, low down in the south, and reference to Norton's quickly identified this as Columbae (Dec. -34.1). A search for was made but it was hidden by the roofs." (Vol. 8, No. 95). And so TA survived its first one hundred issues with the 1972 August issue carrying some special articles. From the night sky clocked up its 31st supplement with John Larard presenting 100 of the Lesser Known Celestial Objects. By the first issue of 1973, glorious drawings and photographs of the planet Saturn adorned the cover. In the same issue the proposed sky patrol was discussed and Steven Anderson was agreed as the organiser. The idea of photographing the sky regularly had been mooted before but at last TA was taking a hand and the project was launched successfully. (Vol. 9, No. 105). "... The long awaited reappearance of the comet from the Sun's rays turned out to be quite a letdown when it was found to be some 1.5 magnitudes fainter than expected." (Vol. 10, No. 114). Nevertheless some finely executed drawings of 1973f appeared on the cover of the 1974 January issue courtesy of George Alcock. "...Comet 1974h was found on 1974 Nov 13 at 3:40 am local time after 17 minutes of sweeping in the first clear morning after more than a week of cloud and rain. The object was in Hydra about 35 above the horizon in the ESE sky... My total hours of sweeping since finding comet 1969i amount to 482." (Vol. 11, No. 128). In the January 1975 issue the editor reported a series of pre-discovery magnitudes for Nova Persei 1974 obtained from photographs by D. Jones. This illustrated the value of obtaining regular photographs via the Sky Patrol which TA had set up earlier. In 1975 July yet more pre-discovery magnitudes were obtained from TA Sky Patrol negatives, this time taken by M. Jaques, and of Nova Scuti 1975. Comet 1975h which carried the rather long name of Kobayashi-Berger-Milon was very extensively observed and reported in the 1975 August issue. The comet was very well placed for northern hemisphere observers. For me, the most hectic time as editor occurred on 1975 August 29 when Honda discovered a nova in Cygnus. News reached us from the USA before the skies darkened. Although the "official" telegram reached me on Monday September 1st at 3pm I had, by then received 37 independent discovery reports by telephone throughout the preceding nights and had had virtually no sleep for three days! The nova was majestic as it reached first magnitude and everyone wondered whether it really was the long awaited galactic supernova. It was not to be but it brought out those who were normally regarded as armchair astronomers more than perhaps any other object for many decades. The Early Warning Circulars had been set up in 1975 March to advise observers rapidly of new discoveries. In the 1975 October issue details of a telephone based system were given and this service continues to this day. "... My discovery of comet 1975p was made during the early morning sweeping session from a lonely roadside spot in the Adelaide Hills east of my home. Having missed out on opportunities to sweep the morning sky for the previous five weeks because of cloud, I was particularly anxious to cover the area before it was blotted out with the light of an approaching full moon. On the morning of November 12 (Adelaide time) I commenced sweeping at 2am. After 2¼ hours I noticed a small diffuse blob of light very close to a mag 11 star in Antilla. Within 10 minutes motion relative to a nearby star was readily apparent... Perhaps the most exciting aspect of the discovery was that the discovery position and the direction of motion appeared to agree with Dr. Marsden's prediction figures for the track of the Kreutz sungrazing comet group." (Vol. 12, No. 141). Unfortunately this comet turned out not to be a sungrazer when the orbital elements were determined. "The most amazing cometary phenomenon I have ever observed! So read my notes from the afternoon of February 25 (1976). Although 1975n did not quite attain the -5 suggested in the February TA Comet Notes it still became one of the rarest astronomical sights, a daylight comet!" (Vol. 12, No. 143). In the following April issue the cover contained another rare event. 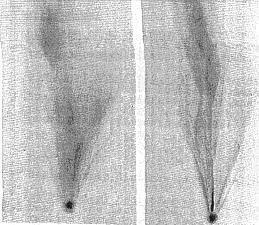 Drawings were shown, by John Bortle, of the breakup of the nucleus of Comet West 1975n. Meanwhile, whilst all of this was happening Bill Bradfield found comets 1976a and 1976d! In the April issue John Hosty proposed a Nova Search Programme. The TA Sky Patrol was still functioning but no actual checking of the negatives was being carried out. In the main, the negatives were filed and consulted when an observational query arose at a later date. The idea of a nova patrol was to gain considerable momentum over the next few months. As if to lead the way with nova discoveries as an example for the proposed patrol, George Alcock discovered his fifth nova in Vulpecula in the latter part of 1976 and a photograph by Walter Pennell showed the object on the cover of the November Issue. The object appeared in a noticeable cluster of stars and the intruder was instantly recognised as disturbing the usual pattern. Peter Birtwhistle had been rather unlucky in photographing a close-up of this cluster just before it revealed the nova but his photographic efforts were rewarded for the nova patrol when colour photographs showed pre-discovery images of HM Sagittae. Although at first this object was thought to be another nova because it had dramatically increased in brightness compared with the Palomar Sky Survey the long term analysis showed it to be an embryonic planetary nebula, certainly a most important object. "... I decided this particular evening to make an estimate of a suspect variable near IQ Per. From 1715-1730UT I swept the region which includes Per and a 10 area was cleared to mag 6. At 1730 I suddenly decided to sweep Aquila-Sagitta (nova patrol area 75)... After five minutes sweeping from Altair to Sge, I suddenly noticed a star close to which I could not recognise from memory on previous sweeps of this region. I immediately became quite excited as I realised that this could possibly be a nova. After the initial surprise and amazement I noted the position and made a field sketch, estimating the magnitude to be 0.3 brighter than a star immediately below Sge." The nova was confirmed at approximately mag 7.0 and rapidly faded from view. How easy it would have been for such a very low object to be overlooked especially in the light-polluted skies of Huddersfield where John Hosty then lived. (Vol. 13, No. 154). Comet Chernykh (1977l) will forever hold a special place in the history of TA. It was never bright but it became the first comet to be measured by the TA team to produce astrometric data. The photo, of 1977 September 3.96 was taken by Brian Manning and measured by Peter Bertwhistle. Could amateurs use ordinary film and not glass plates and still achieve the required accuracy? The answer was an emphatic yes. This work continued to this day and regular reports are e-mailed to the Central Bureau. It was logical to look at the inclusion of an extra-galactic supernova programme and Nigel Henbest described such a project in the 1978 September issue. An initial list of about 100 galaxies was drawn up and whilst this work is very specialised some experienced observers are still active today but many more are needed. The 1978 December issue carried news of an outburst of WZ Sge, a recurrent nova. Robert McNaught, acting for the UK Nova Search Program independently discovered it but was beaten to it by an earlier professional report by Patterson and McCraw. (Vol. 15, No. 176). Another outburst detected by a TA observer was featured on the cover of the 1979 January issue when Aarre Kellomaki discovered a rare outburst of UZ Bootis and settled the doubt over its exact position. Kari Kapanen provided the rare photo showing it in outburst. (Vol. 15, No. 177). The valuable contribution of pre-discovery data from the Nova Search Programme was continued in the 1979 April with the announcement that Mike Swan had prediscovery photos of Kuwano's Object in Vulpecula. The object was very near to the edge of the frames otherwise it might well have been discovered by our team. It had been prominent in the morning sky for some months as we were later to learn. Kari Kaila of Finland was equally unlucky with his photograph of M100. After a supernova discovery was announced he found a previous image on his photograph of this galaxy. Details appeared in the 1979 June issue. Bill Bradfield continued his relentless search of the heavens for comets and found 1979c and 1979l as reported in the 1979 July and 1980 February issues. Certainly Bill was well on the way to creating a world record for comet discoveries. "The evening after Christmas day 1980 was fine and clear... After dark the sky was very clear and I could not resist this rare English event for telescopic work. Firstly I was to make an observation of Comet Meier with the 20cm spec but the altitude was low and I could not see it... Using x35 I settled down to a comet sweep at 1755 starting with 3 Vul to Dra sweeping northwards... The starfields towards the galaxy were gorgeous. Then M56 went by the field bright and clear. Sometime later a dim "M56" was located in a field of faint stars. This immediately aroused suspicion as a stranger, as I had a rough idea where it was by the length of the sweep. On looking through the finder and seeing Lyrae near to the centre of the field I knew that I had a suspect comet. This was at 1850... Later, Mike Hendrie obtained photographic confirmation." (Vol. 17, No. 201). Still in this same issue Bradfield announced yet another comet, 1980t. "On the morning of 1981 Jan 18 I got up as usual to conduct some early morning observations. Just before 0615 cloud cover became evident from the south west so I decided, prior to dawn and total cover, to conduct a nova search sweep with binoculars in Scutum." "At this time of the year I conduct my sweeping from my bedroom window as this gives me a higher elevation permitting viewing above shrubs, trees and rooftops. So, leaning out of my bedroom window I first located the star Aquilae, then swept in a westerly direction. On reaching the field of and R Scuti I noticed clearly an intruder star placed to the Southwest of . My mind went blank as I checked my star chart but found no star in that position... I estimated the magnitude was 8.0. By this time cloud cover had reached the area." (Vol. 17, No. 202). A photo was taken on January 20.25 by the RGO and this appeared to show a magnitude 9 object in close agreement with Branchett's position. Later Dave found his observing log showed a query star in that spot some years earlier but nothing could be found on the Palomar Sky Survey in the position measured by the RGO. Was it a nova or some hitherto unknown type of variable star with a very large amplitude. We continue to monitor the position in the hope that a member of the TA team finds it in outburst again. On a recent visit to the UK Rob McNaught re-examined the RGO plate and suggested that the image could have been a flaw. Whilst Jim Muirden envisaged in the early issues that TA would not normally undertake analyses of objects there has been the occasional exception and such was the case with the supernova in NGC 6946. The 1981 March issue mentioned that 127 visual and 55 photographic results were being analysed! Throughout many issues of TA the comet notes contained pleas for observers to monitor Comet Schwassmann-Wachmann for optical outbursts. This paid off when Jean-Claude Merlin, Le Creusot, France, detected the comet bright on 1981 April 22. His account appeared in the 1981 May issue. We were saddened by the news that Ronald Muirden, who for so long had produced TA, had died on July 19 of that year. The obituary, by James Muirden, appeared in the 1981 September issue. In the 1982 April issue TA improved its service still further by going to four pages of cover material. The front featured an excellent photograph by J.D. Waldron of an auroral storm. Equally impressive was a sequence of lunar eclipse images taken by P. Parvianen which were taken in such extreme cold that the camera shutter froze and the rest were obtained with a hand shutter technique! The next issue (Vol. 19, No. 217) contained a note in the editorial that a supernova search atlas was to be prepared to aid the supernova search program. This has presented a formidable task but today numerous charts exist, some with detailed and accurate sequences. After 18 years TA increased from the traditional quarto size to A4 in 1982 September. 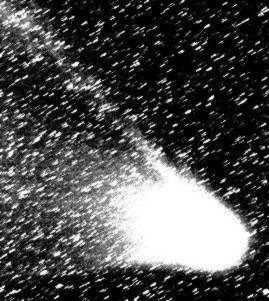 A month later Comet Austin (1982g) was extensively observed and reported. Up to that time 231 results from 25 observers in nine countries had appeared in TA just for this one comet! The most eagerly awaited event in astronomy was finally announced in the 1982 November issue when Comet Halley was recovered. The research by Robert McNaught continued and success was quick with the discovery by him of an outburst image of VY Aquarii on the Papadoupoulous Atlas. The relevant print was from a photograph taken on 1973 July 31. The 1983 April issue contained a spectacular photograph of the summer Milky Way by Herman Mikuz who operates on behalf of the nova patrol from Slovenia. In the same issue Jean-Claude Merlin reported the discovery of a possible fast moving asteroid in the same field of view as 1620 Geographos on 1983 March 10. Other possible images were obtained but conclusive evidence was never obtained. The big event of 1983 was undoubtedly George Alcock's fifth comet, the discovery of which was shared with the IRAS satellite and Araki. When the editor was requested to obtain confirmation the comet was already 6th magnitude and very well placed. Clearly any comet or nova can escape detection until bright which makes binocular and naked-eye checks so well worthwhile. Although for the first time George had to share the title of the comet it was another jewel in the crown of Britain's most prolific discoverer. A detailed report of the discovery appeared in the 1983 May issue. As if all of the research by Rob McNaught which had revealed so many outbursts of VY Acquarii was not sufficient he made absolutely sure by also detecting it visually in outburst for the first time in its history! The 1983 December issue carried the news of this remarkable success story. The 1984 April issue of 'The Astronomer'' marked the 20th Anniversary of the group and contained many special articles by famous names of TA's past such as Jim Muirden (founder Editor) and John Larard (a former TA Secretary). Spectacular drawings and photographs of Jupiter and Mars by J. Dragesco graced the cover of the 1984 June issue (Vol 21 No 242). The amount of detail seen on Mars, in particular, was truly amazing even though observed from the dark skies of the Republic of Benin in Africa. During mid 1984 the Editor started a new job in Hampshire/Berkshire which meant being away mid-week until a house move could be arranged. During this time the 'TA team'' provided excellent back-up so that any discovery claims were thoroughly investigated. Finally in the November issue the new address in Basingstoke appeared which has remained unchanged ever since. One of the key constellations for nova hunters, Vulpecula, was again in the news when on 1984 July 27 Wakuda (Japan) found a magnitude 9 nova by photographic search. (Vol 21 No 244 p53). Annick Merlin (the wife of Jean-Claude Merlin, France) narrowly missed being the first to record it as she had photographed and recorded the nova on 1984 July 28 (21.55UT) prior to the discovery announcement. The photograph appeared on the front cover of the 1984 October issue. Visual discoveries of galactic novae. Visual monitoring and magnitude estimates of variables. Visual and photoelectric attempts to record occultations by minor planets. Visual magnitude estimates of comets. The constellation of Vulpecula, despite its small area, was again in the news when Collins (USA) found a nova on 1984 Dec 22 (Vol 21 No 249 p143). Brian Marsden asked for confirmation and after the Editor established it was cloudy throughout the UK, he consulted the London Weather Centre. They were most helpful and suggested a 'small cloud gap'' existed in Belgium according to satellite data! A telephone call made to Patrick Wils in Niel brought confirmation and the TA team fed back to Brian the necessary information to enable the discovery to be announced. TA, with the help of the Weather Centre and its world-wide group of observers had beaten the weather! Many variable stars appear only very occasionally and such is the case with the UG-type star HT Cas. Timo Kinnunen, Finland reported on 1985 Jan 13 that HT Cas had been seen. The Editor confirmed this with an estimate of 11.9. The mag 13 companion, which caused so many erroneous reports in the past and subsequently, was also seen to confirm identification(Vol 21 No 250 p162). Denis Buczynski and Dave Greenwood photographed and measured a precise position, the photograph appearing on the covers of the 1985 February issue (Vol 21 No 250). Also in 1985 January another significant find was made by George Alcock who, on Jan 30.22UT found RS Oph (a recurrent nova) in outburst at mag 6. The event was confirmed by the Editor just one hour later in the dawn sky. Steven Lubbock had recorded it at 10.6 on Jan 21 so the outburst curve was quite steep. (Vol 21 No 250 p170). A photograph by Herman Mikuz taken on Jan 31 appeared on the cover of the 1985 April issue. During the early months of 1985 various amateur astronomers attempted to photograph Comet Halley (1982i). P.Martinez and E.Laffont (France) finally sent in convincing evidence on a pair of photos obtained on 1985 Feb 19 which appeared to show the correct movement between exposures. The International Halley Watch was formed and TA's pages offered guidance on how its members could help in this venture. Photographers were increasingly reaching fainter and fainter magnitudes. This was illustrated by a series of results from Brian Manning and Alan Young showing a recently-discovered supernova (SN 1985H) at about mag 16.5 (Vol 22 No 253 p9). UV Per, a well known UG star attracted attention in 1985 April when one of its 'yearly outbursts'' was well observed. However David Stott subsequently reported it bright again on May 17 (27 days after initial maximum). Although unconfirmed, it increased speculation that 'double maxima'' might occur in such stars. CCDs were then in their infancy but an interesting early article by Jeremy and Tony Cook describing such equipment appeared in the 1985 July issue (Vol 22 No 255 p44). Halley's comet continued to attract attention and a photographic recovery from England by Alan Young appeared on the front cover of the 1985 Sept issue (Vol 22 No 257). The RGO kindly computer enhanced the images and this appeared on the covers of the next issue together with photography of the comet by Ron Arbour (Vol 22 No 258). Earlier success by Robert McNaught with detection of VY Aqr (see earlier in this article) led to his preparation of a list of other possible 'recurrent objects''. Steven Lubbock was observing DO Dra, a candidate suggested, for the 80th time since starting his patrol of such objects, when on 1985 Oct 28 he recorded it at mag 10.5. The results appeared on IAU Circular 4130. TA has never restricted itself to set observing programmes or objects. Anything observable can feature in its pages. Brian Manning presented unusual photographs in the 1986 March issue (Vol 22 No 263) showing Oberon and Titania, satellites of Uranus, originally secured on 1961 Mar 15 (before TA's inception!). Another ''obscure'' object, the quasar QSO 0716+332 was reported in outburst by B.Wills (USA) and Alan Young provided a photograph of 1986 Apr 2 on the cover on the 1986 May issue (Vol 23 No 285). Meanwhile Comet Halley, which had dominated the issues of TA and its covers since the 'amateur astronomer recoveries'', now really came into its own and spectacular photographs continued to appear especially from the Southern Hemisphere. Those by Marie-Claude Bonnet and Patrick Martinez on the cover of 1986 June (Vol 23 No 266) also demonstrated the scope for studying the wealth of detail in the coma and tail of bright comets. The age of electronic mail, as a medium for rapid communication between observers, was proposed in the 1986 August issue when the editor arranged a PRESTEL mailbox. (Vol 23 No 268 p 50). This was followed by a full-scale e-mail box set up on Microlink started in 1987 January. On Jan 24 at 15.47UT history was made with the issue of the first TA Electronic Circular relating to the discovery of comet 1987c. An early 'PRO-AM'' venture was also announced in the Sept. issue (Vol 23 No 269 p75) when professional astronomers in Tenerife suggested a target list of eruptives for simultaneous monitoring. In the same issue Wakuda's discovery of Nova Cygni 1986 was announced, the news having reached us via a computer link established with the Central Bureau in USA. One of the most spectacular photographs ever to appear in TA was provided by J.Dragesco who, observing from Pic-du-Midi Observatory, secured an amazing picture of the planet Mars which appeared on the cover of the 1986 Nov issue (Vol 23 No 271). The same observer followed this feat with a photograph of the transit of Mercury across the face of the Sun from Butare in Rwanda (cover, Vol 23 No 272). Robert McNaught was rarely out of the news and to prove the point reported discovery of a nova in Centaurus on 1986 Nov 22 bringing the second success for the nova patrol. He followed this on Dec 14 by finding a nova on photographs of the Small Magellanic Cloud! (Vol 23 No 273, p138). Novae were much in the news when Suzuki (Japan) reported discovery of Nova And 1986 on a photograph taken on 1986 Dec 5. The sensational announcement of a supernova in the Large Magellanic Cloud surely was the key event of this ten year supplement to TA's history. With the invaluable help of Rob McNaught, additional photographic covers were prepared in record time and added to the middle of the 1987 March issue. This was the first time this has been done in TA's history and the supporting article by Rob provided a vivid account of discovery developments for those unfortunate observers in the Northern Hemisphere who could not see it! The third nova discovery for the Patrol was achieved, again by Rob McNaught when he found a nova in Sagittarius on films of 1987 May 18 at mag 10.5. (Vol 24 No 278 p23). Rob followed this by the discovery of a comet (1987b1) on 1987 Oct 18, again using photographic techniques. (Vol 24 No 283 p124). Yet another nova was 'claimed'' in Vulpecula on 1987 Nov 15 this time by Beckmann and Collins (USA). Nick James had photographed it on Nov 12.8UT at mag 8.0 but could not check until later as on Friday 13th he was moving house! Such are the frustrations of patrol work. (Vol 24 No 284 p157). Discoveries were not confined to novae and comets. Richard Fleet, another TA subscriber, had found a new dwarf nova, initially designated FSV 113211, in Crater during checks on comparison stars for Comet Halley in 1986 August. His discovery account finally appeared in the 1988 Jan issue. (Vol 24 No 285 p177). Supernovae continued to appear in the news, thanks mainly to the outstanding search and discovery work by Bob Evans in Australia. In the 1988 February issue we note that Bob was to receive the 'Order of Australia Medal'' (similar to the MBE) for his outstanding achievements. Then in 1988 March came a further success for the Nova Patrol when Dave McAdam found a possible nova on Mar 21 in Andromeda. The preoutburst and post-outburst photos appeared on the cover of the 1988 May issue (Vol 25 No 289) and details of the find also were published on IAUC 4570. Later research on this fourth discovery for the patrol suggested it might be a WZ-Sagittae star of which only a small number are known. Professional-Amateur co-operation was again discussed in the 1988 July issue following a UCL meeting when a committee was formed to track such work. This has continued successfully to this day, although perhaps with very little publicity for such a worthy cause. To support the need for better communication in PRO-AM, the Editor was also given facilities for e-mail on the RGO system and STARLINK. A video service was launched in the 1988 October issue and typically the first for hire was 'Greetings from Down Under'' by Rob McNaught! The 1989 February issue contained the first of what was to become a long string of variable star discoveries by Mike Collins made during his photographic search for novae. His first detection was of NSV 01098 in Cas on films of 1989 Jan 10. (Vol 25 No 298 p203). He went on to show that there are many variables which can still be discovered using red sensitive films such as Kodak 2415 and which escaped detection on blue plates used on older patrols. Bob Evans reported yet another supernova discovery (SN 1989B) in M66 found on Jan 30. Although an English amateur had seen it on Jan 29 he communicated his discovery by post and lost priority. On 1989 May 24 Makino (Japan) reported the discovery of an x-ray nova with the Ginga Satellite. The Editor alerted patrol members in case an optical component might be visible. Martin Mobberley photographed the area on May 26.99UT. Following a suggestion by Brian Marsden that the object might be Nova Cygni 1938, Martin emailed a 'map'' which allowed the Editor to confirm the latest photograph did show a mag 12.8 object co-incident with the 1938 nova. (Vol 26 No 302 p26). To continue expansion of TA services, a GOLD subscription was launched at the 1989 AGM. The latter meeting was also attended by a record number of members (88) thanks largely to Brian Marsden's presence as principal speaker. One of the memorable events of this period for Northern hemisphere observers was the occultation of 28 Sgr by Titan. This was well seen from the UK as was the 'Central Flash'' which was also captured by Terry Platt on CCD (cover Vol 26 No 304). Although TA observers had by 1989 probed into virtually all areas of observable objects, one area remained elusive to British amateurs, the discovery of asteroids. Rob McNaught wrote an excellent article in the 1989 Sept issue (Vol 26 No 305 p93) indicating it was possible despite the light-polluted skies. He suggested a special project to start on 1989 Oct 1. This was all that was needed to stir Brian Manning into action who then discovered two asteroids (1989TF and 1989TE) on Oct 4 and confirmed them on Oct 5. The last discovery of a numbered minor planet from England was (676) Melitta in 1909 January! This achievement was outstanding especially as the two objects were of mag 16-17 and moving objects this faint are also difficult to record. Photographs appeared on the cover of the 1989 November issue by which stage 1989TF had been linked with 1968OF. Brian Marsden gave an excellent account of the procedures for numbering asteroidal discoveries in an article in the same issue (Vol 26 No 307 p150). A subsequent listing of positions obtained by Brian Manning and further discoveries made appeared in the 1990 April issue. A sad loss was recorded in the 1990 March issue when news was carried that Alan Young had passed away on Feb 6. He had contributed so much to TA and, as noted in the obituary, had never in the Editor's recollection, ever refused to check and attempt confirmation of the numerous discovery claims which reach TA HQ. A further loss was noted in 1990 May issue when Jack Ells passed away on 1990 Mar 29. He was a founder member of the Crayford Manor House Astronomical Society. Meanwhile Comet Austin (1989c1) proved to be an exciting object and a fine multiple tail was recorded by Glyn Marsh and Denis Buczynski in their cover photograph of the 1990 June issue. Services from TA continued to expand with the announcement of 'FINDERS'' software in the 1990 August issue, thanks to work by Nick James. This permitted charts to be sent by e-mail for the first time. The discovery of further outbursts of recurrent objects continued with the detection by Patrick Schmeer (Germany) on 1990 Sept 16 of FN And. It had previously been recorded in 1965 Sept by Hoffmeister. Mark Kidger reported in the 1990 Oct issue details of 'The Great White Spot of Saturn' which had been found on 1990 Sept 25 by S.Wilbur (USA). His article related an earlier discovery of a similar feature by the famous Will Hay, actor and comedian, in 1933. (Vol 27 No 318 p123). Dragesco provided a rendition of the feature on the cover of the following issue. TAV 0033+59 was the designation given to one of Mike Collins' numerous variable star discoveries. However this behaved differently to earlier finds having maintained a constant brightness from 1988-1990 before fading in late 1990 October. There is a suggestion that it may belong to the rare class of gamma Cas variables. 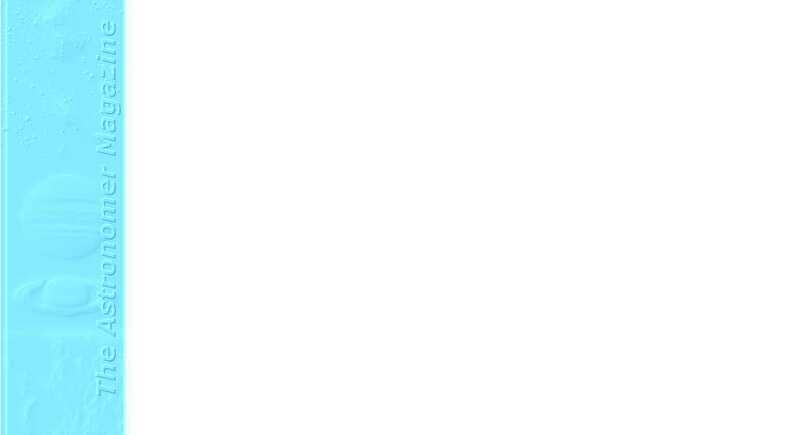 (Vol 27 No 321 p191). Further sad losses of the 1990s occurred when news reached us that Jack Bennett and Minoru Honda had passed away. During recent years many of the world's greatest amateur astronomers had gone and TA recognised a need to 'train'' newcomers in an effort to bolster the team. The 1991 April issue carried the sensational news that George Alcock had discovered his fifth nova, and from inside his house! The confirmation was equally remarkable when Denis Buczynski photographed it in the strong dawn sky of 1991 Mar 25 when only Deneb was visible to the naked eye! Just 2.5 hours after discovery, a TA E-Circular was issued and the world's astronomers alerted to the new mag 5 object, also co-discovered by Sugano in Japan. The International aspect of the Nova/Supernova patrol continued to pay dividends when Mirko Villi and Giancarlo Cortini in Italy discovered supernova 1991T on 1991 Apr 15, the first for the patrol. (Vol 28 No 325 p2). 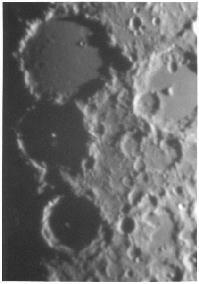 CCD work was advancing rapidly with the quality of images improving continuously, especially with regard to planets. This was clearly illustrated by the wealth of detail recorded in images of Jupiter secured by Terry Platt which appeared on the cover of 1991 Aug.
A further advance in the communications power of TA was made possible by the kind assistance of the British Astronomical Association when they helped with the purchase of a fax machine in 1991 November. Its subsequent use has been remarkable both in the issue of circulars to those without e-mail and as a way of assisting with exchange of charts on PRO-AM projects. Mauro Zanotta (Italy) joined the growing ranks of discoverers amongst the TA membership when he found a comet on 1991 Dec 23, also co-discovered by Brewington (USA). TA members continued to search for new projects following the success with asteroidal discoveries. An excellent article by James Bryan (USA) provided details of a search being conducted for classical novae beyond the galaxy. It was suggested that M31 and M33 may prove fruitful areas for this search. Novae continued to appear 'nearer home'' when Collins (USA) found one in Cygnus on 1992 Feb 19. Again swift confirmation came from an appeal to the TA group when David Moore in Ireland responded to advise he had seen the object less than 24 hours later (Vol 28 No 335 p246). Although analyses had not previously been a major role for TA, on this occasion the Editor began logging the nova results to a computer file. This led to the discovery of a series of shallow minima which were investigated in detail by Mark Kidger, yet another example of PRO-AM co-operation. (Vol 29 No 338 p37). Paul Camilleri in Australia also continued to make numerous nova discoveries from the Southern Hemisphere and then joined TA in 1992 August! The big event in the comet world happened with the long-awaited recovery of Periodic Comet Swift-Tuttle (1737 II= 1862 III = 1992 XXVIII = 1992t) found by Kuichi (Japan) on 1992 Sept 26 (Vol 29 No 342 p132). An enormous number of observations followed in subsequent issues. The 1993 February issue marked a change of production. Rising costs and totally unacceptable delays by the old printers threatened TA's role of rapid publication. A Basingstoke firm took over both cover and main magazine with immediate improvement in speed of publication. And, at last, those dreaded staples, which had torn so many fingers over the years, were wrapped safely inside to prevent further 'claims for damages''! Francisco Garcia of Spain hit the headlines with a discovery of a bright supernova in M81 on 1993 Mar 28, the brightest as seen in the Northern Sky since 1937. (Vol 29 No 348). The subsequent data collected demonstrated just how unusual this object was. Two maxima were logged as illustrated in the listing of daily means in the 1993 July issue. (Vol 30 No 350 p44). Mike Collins came close to the discovery of a Nova in Aquila which he recorded at mag 7.6pv on 1993 May 15.01UT (Cover, Vol 30 No 349). However Yamamoto (Japan) recorded it slightly earlier on May 14.64UT and claimed the discovery. TA's success over the years has been largely down to a very effective team supporting the editor and a loyal band of world-wide observers supporting the team! John Colls stepped down from the post of secretary in 1993 August after 13 years in the role. We owe him a great debt of gratitude. 1993/1994 are the years of a startling rise in the effectiveness of amateur astronomers who are equipped with CCDs. They now provide the opportunity for TA members to reach limits which a few years ago could only be considered within the province of professionals. One of the faintest comets ever recorded from the UK, P/Comet Spitaler (1993r) was imaged via CCD by Martin Mobberley on 1993 Nov 11 near magnitude 18. (Cover, Vol 30 No 356). The sky always hold surprises. With the discovery by Kanatsu (Japan) of a nova in Cassiopeia on photos of 1993 Dec 7 the object became the first classical nova ever to be confirmed in this constellation during modern times. (Vol 30 No 357 p194). This object and several in recent years were also subjected to intense scrutiny thanks to daily e-mail exchanges between groups on a world-wide basis. This also meant that over periods of months not a single day had been lost in the case of several recent novae. The story of Nova Cas 1993 continued in the 1994 March issue with details of how its light curve resembled the rare class of DQ Her type novae. (Vol 30 No 359 p242).